Automotive industry is using laser cutting fabric mostly for two items: Laser cut safety airbags as well interior covering. Laser cutting automotive airbags provides 100% consistency. Cutting airbags with laser cutting machines allows very efficient R&D stage. Any changes in design could be implemented on laser cutting machines within minutes. At the end laser cut bags are consistent in size, shape and patterns. Laser heat enables healing of the edges. Layout of the patterns are usually done highly efficient as well. Laser cutting interiors for the automotive industry. 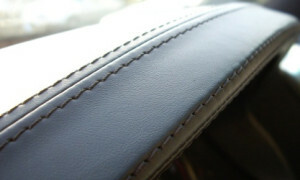 Laser Cutting upholstery is very well known process. Laser cut part are precise, consistent and very accurate compare to other cutting processes. Laser cutting leather, leatherettes, felt, suede and other materials is allowing to bring highly efficient process to automotive industry. One of the interesting steps in laser cutting seats is ability to perforate the fabric or leather with a tight array of the holes of the certain pattern and size. 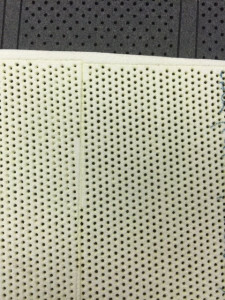 One of the desirable processes is a laser perforation. This step of laser cutting seats is allowing to perforate the fabric or leather with a tight array of the holes of the certain pattern and size. It requires to provide a high level of comfort, ventilation and absorption of the car seats. Our process allows laser engraving of leathers and fabrics. There are cases when designers want to have logos or process notes to be engraved. Laser engraving leather, leatherette, felt, neoprene, and velvets produces very interesting surfaces similar to embossing or branding. Especially in auto industry such branding is very desirable and can be personalized.